Let’s go back a bit. The world took a hit of one of the most addictive items in 2007 when Steve Jobs announced the iPhone. For those that were using phone before the iPhone came out, you’ll remember innovative features like how small can we make these phones, picture messaging, and even PDA features. As an early adopter of the iPhone, I remember people saying they’re not sure they need to get email on their phone and it’ll never replace my point and shoot camera. Fast forward to nearly the 10 year mark coming up and it’s a rarity to see anyone without a “smartphone.” It’s become the essential device that everyone has on them all the time. It’s the device we wake up to and the device we go to bed with. I was out to dinner a few days ago and I watch a young couple eat together. The guy was on his phone the entire time, scrolling with his left hand and eating with his right hand. His presumably girlfriend was eating next to him, staring into space. Instead of striking up conversation as we used to, this couple were connected to the world at their fingertips but so far apart they might as well eat alone. This used to be an extreme case but it’s the norm today. We spend more time photographing our meals and sharing it with the world than we are sharing it with those in front of us. Is this old fashion thinking? I don’t think so. It’s not a generational issue, it’s not an age issue. It’s happening across the board. The appeal of connection of our phones, apps, social networks is addicting. Infinite scrolls is infinite, the news and updates will never end. I caught myself in this addiction. My world was projected on a four inch screen. I was caught up on 4K resolution screens rather than the 360 immersive resolution of the real world. It’s the fear of missing out that drives us away from the beautiful world back into the virtual world. Instead of living our own lives, we live in the lives of filtered and staged experiences of others. I’m calling it out now. Please innovate us out of this mess. Get us away from the touch screen and back to the big world again. Make wearables that tap us when something is important for our attention and make interactions with machines where we can do so looking up rather than down. Technology should enhance our lives, not replace it. My two were staycation is slowly winding down. I spent about six hours a day working on finishing out my partially finished basement. About four years ago, we had a refrigerator line burst and it ended up flooding the basement ceiling. I used the home insurance payout to replace my electrical system instead of repairing the drywall. 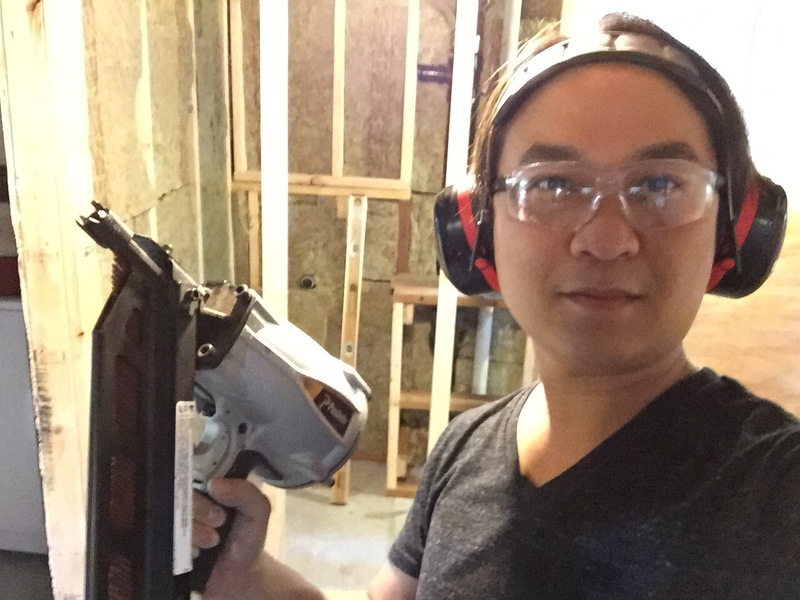 Over the past few years, I’ve torn out most of the drywall and replaced the electrical and plumbing system as well as install a furnace. This project was to learn new trades as well as finally finish up the space into something liveable rather than just storage. 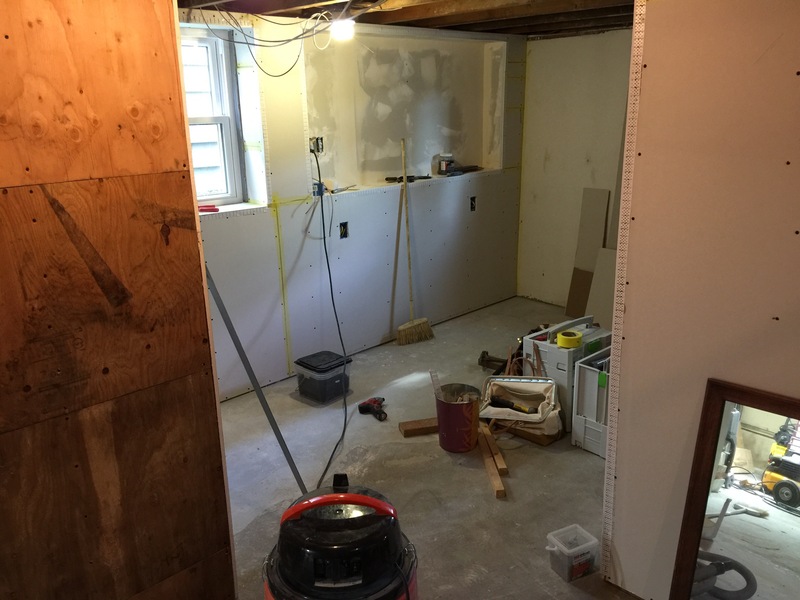 Concrete work – leveling out the basement floor. I used twenty bags of self leveling underlayment to fill in various dips in the basement slab. Concrete grinding – I had to cut up a foundation block where the old chimney used to be. This involved connecting my circular saw with a diamond blade and cutting a grid pattern into the foundation and chipping it away. Framing – no structural work was needed for this project. Instead, I framed in three partition walls into the space and a knee wall along the foundation perimeter. 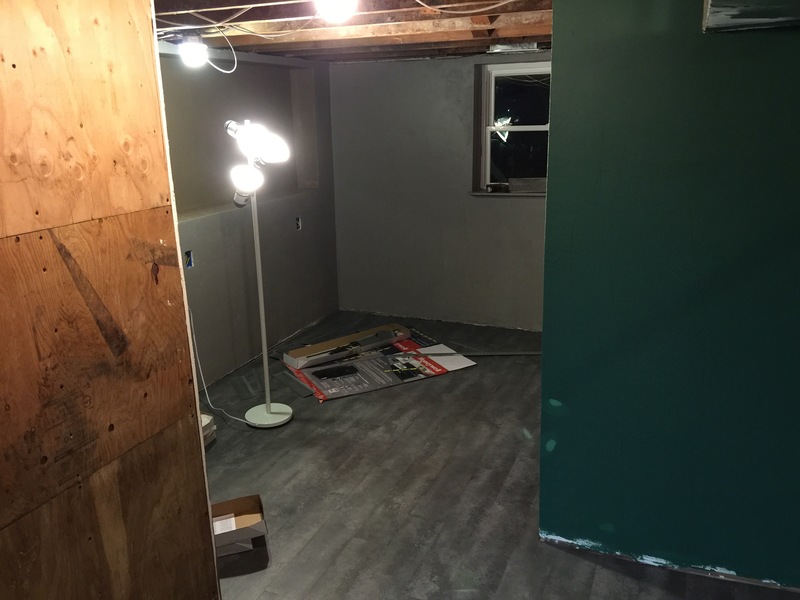 Electrical – I pulled wiring for six outlets along the new partition walls. 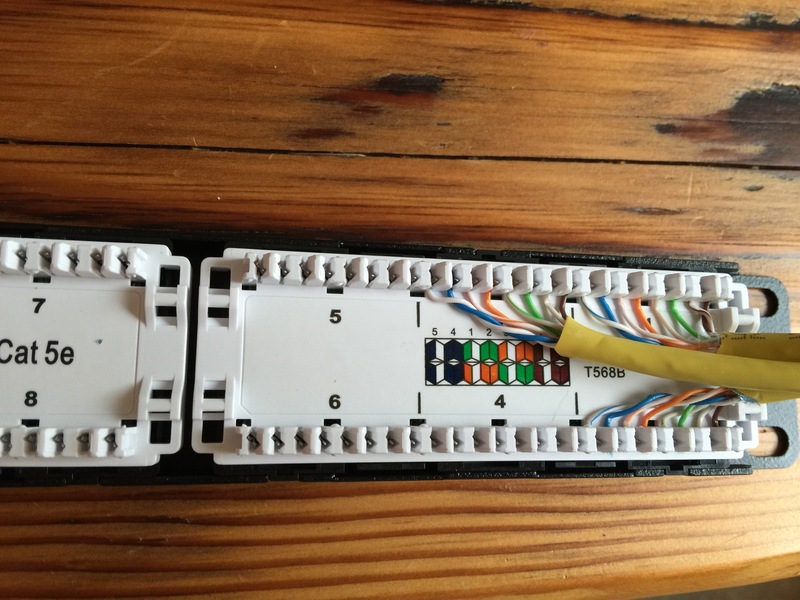 Networking – two pulls of Cat 6 Ethernet went along to each room in the house. With the basement walls opened, it was time to pull the wiring before I closed it up. Insulation – four bags of Roxul insulation was used to insulate and also create noise blocking for the partition walls. Drywall – hung ten sheets of drywall. 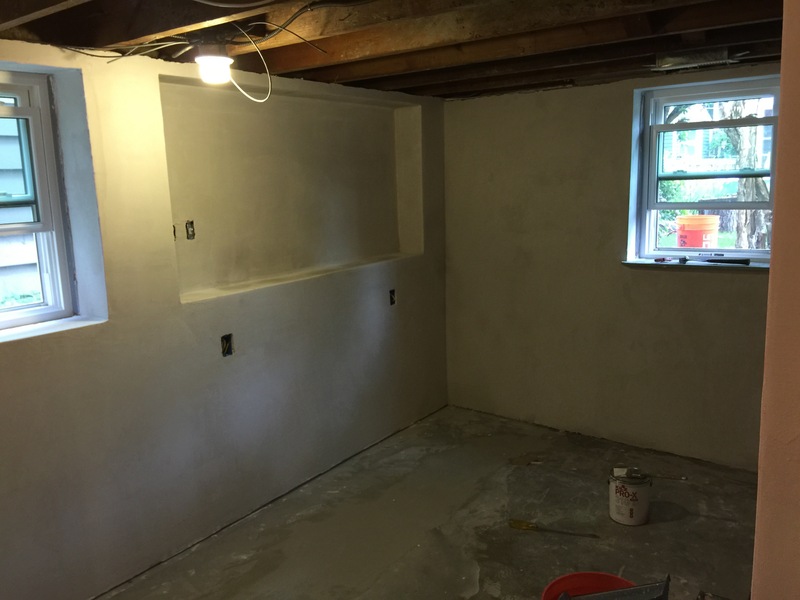 Plaster – applied four bags of plaster veneer base coat. I didn’t use a finish coat because I wanted the sandy old world look. 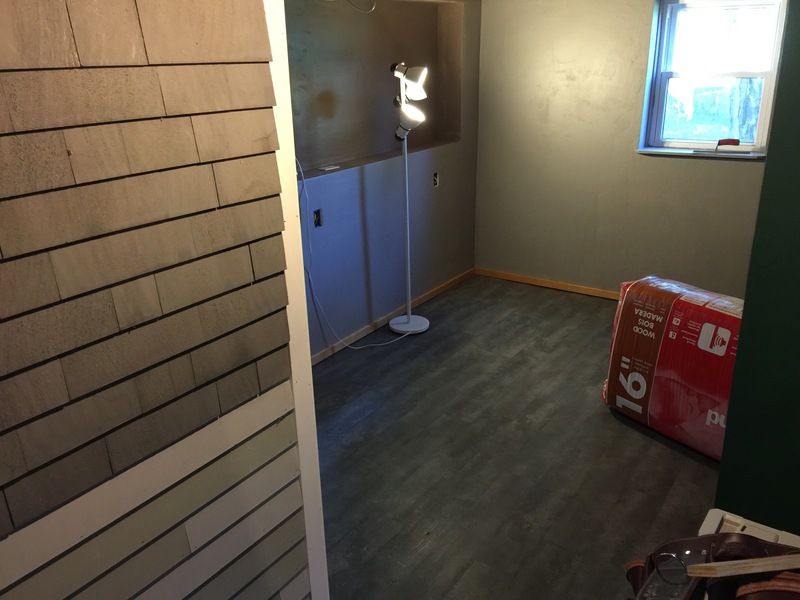 Flooring – installed 22 boxes of resilient vinyl planks. This by far was the worst job requiring a lot of kneeling on the floor and standing up and down. Trim – trimmed out the baseboards along the floor. I finished the project in about ten days. It could have gone faster had I worked longer days but I wanted to take it easy. Most importantly, this was a good break from my day job and used muscles (literally) I don’t normal use. It also tapped into a different part of the brain and stretched me in different ways. As a project manager, my job is to plan everything out. This project was 100% winged. I made everything up as I went (and made relatively few mistakes along the way). Don’t think I want to do another project this size again but I did learn a few new trades along the way. Hung the drywall and installed plywood sheathing. No one plasters here in the West Coast. 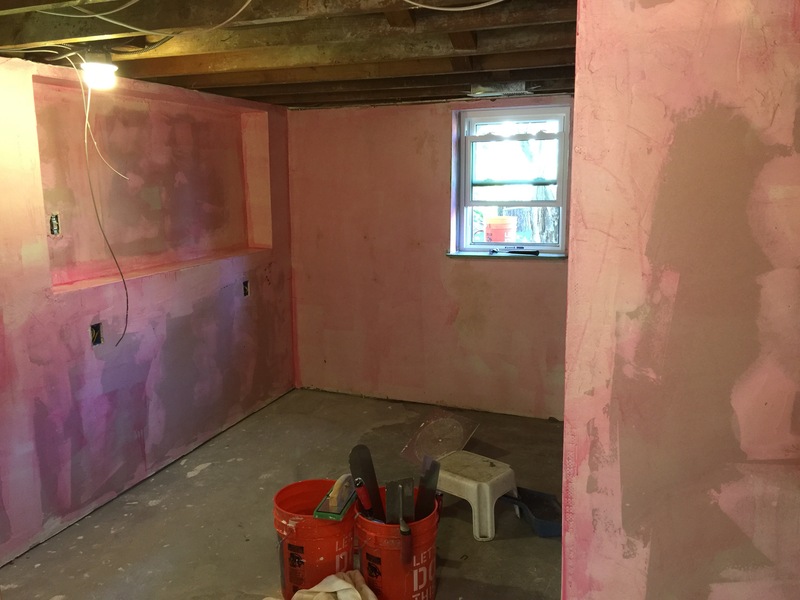 This pink stuff is plasterweld, a bonding agent that helps the plaster adhere to drywall. My favorite part of the project was plastering. It’s a lost art and really fun. Primed and painted the walls with whatever paint we had stored up. The flooring was easy to get start but really became a nighmare project. It was painful standing up and down constantly over two days. Here’s the finished room (need to install the outlets). In a world where distractions are the norm, there are a few techniques I use to keep that to a minimum. Music and a nice pair of headphones is my current solution. I recently discovered Focus@Will, a music streaming service that’s designed specifically for this. For me, I’ve always leaned to Daft Punk and the Inception sound track as my go-to tracks for focused work. Focus@Will curates music with the optimal tempo, rhythm and tones to get into the state of flow. There are channels that are spa and nature, but also classical music and high energy music. Each channel helps you tune in specifically for your work demands. There are also special channels for brainwave entrainment, tuned to lock your brain into a specific frequency. The effects are temporary and only last when the music is play. I compare this to a meditative state. All this sounds like a bunch of BS and that’s what I thought initially. I gave the free trial a run, no credit card needed. I’m generally a skeptic so the trial was worth putting this service to the test. I’m currently working on a high stress project with multiple workstreams. Focus is critical especially since heads down time is limited. When I do get time to work at my desk, I want to make the best use of the time. I have found that putting the headphones on and playing the ambient channel (my favorite) keeps me in the zone. It’s a different focus than my typical Daft Punk playing. I’m much more zoned out and tuned into the work in front of me. The only downside is I’ll be completely disconnected from my environment and people have to wave me down to get my attention (isn’t that a good thing?). I rarely endorse a service but in this case, this is money well spent. I highly recommend Focus@Will and recommend you give it a trial run (affiliate link). I’ll report back in a few months after more usage. n my search for the ultimate lifetime bag, I came across a new addition to my collection: The ColsenKeane 4313 Minimalistic Satchel in Crazy Horse Leather. In a world where everything is mass manufactured in some off-shore location by assembly line factory workers, ColsenKeane is truly a throwback in time of old-timer leather craftsmen. Meet Tony Bozeman, one of two leathersmith working at ColsenKeane led by designer and founder Scott Hofert. Tony literally put together my bag start to finish. When an order is placed, these guys pull out a roll of hand selected leather and put blade to hide. The effect is a bag that’s perfectly imperfect, made by someone that loves their craft. This bespoke approach and American made means the bag is spendy. Like any piece of art, I like to factor in the time and materials it takes to make a bag like this and you appreciate the value you get for the price. I live in the world of digital and analog. My tools are digital, spreadsheets, databases, and computing devices. 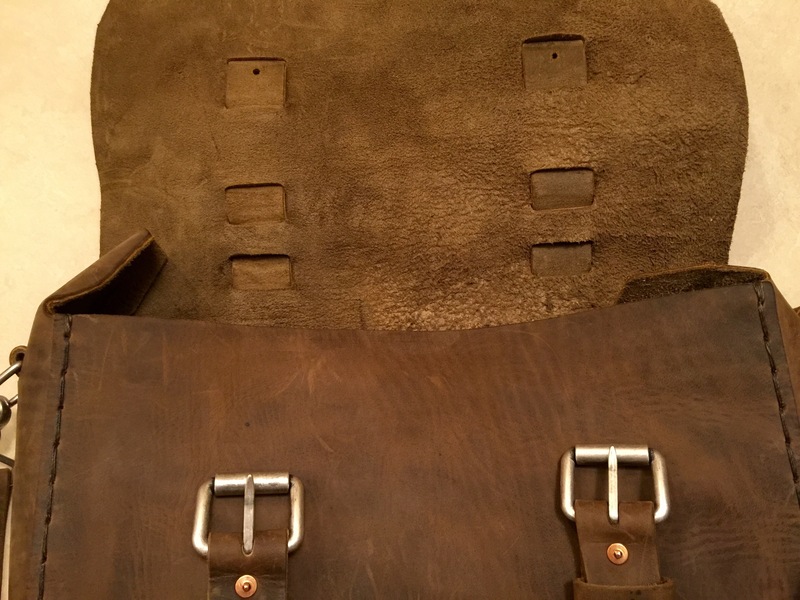 What ColsenKeane has done with their bags is take a very grungy and beefy piece of leather and craft it into a minimalist, slick, and modern design. Every part is built with a specific purpose and no more. It’s made of one think piece of thick 10oz leather that makes up the front, bottom, back, and flap. Two side pieces are stitched together with heavy duty waxed nylon thread forming the rectangular briefcase-like body. I noticed that it’s double stitched, meaning two thick strands of thread are woven in an overkill fashion. This is not a high fashioned bag, the fit and finish is rough by design. It feels like a cow was slaughter, tanned, and woven together in the back country for the modern day man. It balances out and warms our cold machined aluminum products. Two belts are woven throughout the satchel making it a part of the bag, not just through loops like most bags. The handle is just a simple strip of leather that’s hooked into the two belts, forming a cohesive structure, not just individual elements. The leather comes from high end US tanneries and I chose crazy horse. It has waxes that are buffed in. As a result, when you touch the leather, fold it, or scratch it, the colors change and comes to life. Every time I touch the bag, it seems to change. Crazy horse also looks antique out of the box and only gets better with age. I can’t wait to see how this bag changes over the coming months as it breaks in. I went with a very simple design, no organizers on the inside and a magazine pocket on the outside. This completely free form space allows me to update my bag as my technology and needs change. For now, it’s a weekend diaper bag when I’m out and about with the baby. It’s also my thinking bag when I need to get away and focus on life. This bag is the balance of two worlds, modern and old world. The design is modern, yet the materials are old world with copper rivets that will form a beautiful patina. It can carry our technology like laptops and tablets yet balances out all that tech with rugged organic, taking us back to a time where we were more in touch with nature. The minimalist design is offset by the manual process used to create the bag. Edges are raw and hand cut. Copper rivets are hammered by hand. The leather celebrates the imperfections of the hide. In a world where everything is mass produced, this is a product that truly is uniquely you. Finally, I find that the satchel’s closure design requires extra effort to open and close. In a world where we’re looking for quick release mechanisms, I do find and appreciate a system that requires you to slow down. It’s just a reminder to stop running around all day and take a moment and enjoy the tactile feel of lashing in the belt to the buckle and strapping it down. Two belts are lashed through the bag and tied down. The leather is starting to break in a bit as I use the bag. The handle is looped into the belts. When closed, all the weight is pulling from the bottom of the bag and evenly distributed. The stitching is really rugged and doubled up. The back side of the 10oz hide is unlined. 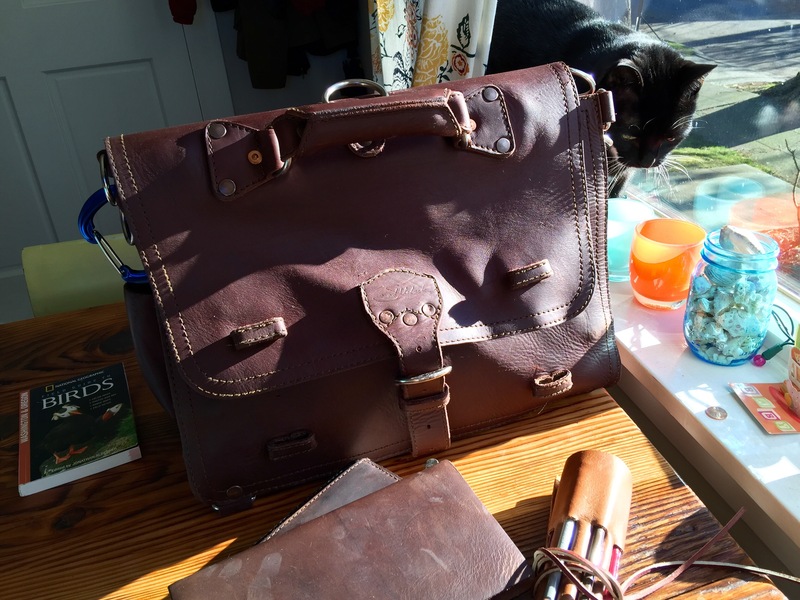 hen I got my Saddleback Briefcase, I went on a process to break it in so that it’s more manageable as an every day bag. Out of the box, Saddleback products are beautiful but very stiff. 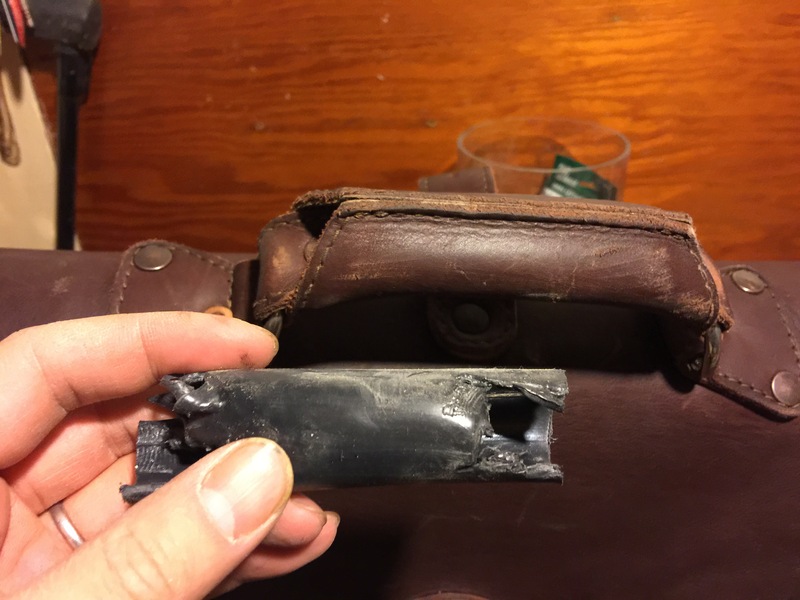 My last bag, the messenger, took a solid two years to break in. I’m hoping to accelerate the process this time with my briefcase. Edit: There’s a lot of commentary online about how this is cheating the aging process. There are methods to truly doing this and will create an immediate aged look. I’m not trying to accomplish that with my briefcase. Instead, I’m looking to break it in quickly so that it’s truly functional as an every day bag. For a bag that’s marketed to fit Apple products, I’m pretty sure most users aren’t mountain climbing with their briefcases. This method was intended only to do the initial break in, like a new pair of baseball gloves. It’s the years of use that will later add the patina. The following procedures may void your warranty. Do so at your own risk. Shh… don’t tell Saddleback about this, my warranty is probably void now. I didn’t buy the bag for the 100 year warranty. I bought the bag because I know this is one I don’t need to baby and it was built to take the beating. Stuff the bag with books, magazines, and as much weight as you can. Hang it for a couple days. This will stretch out the bag a bit and loosen it up. I had double finding a place to hang that much weight so I rigged up a 2×3 that saddled across two saw horses and hung my bag on that. Rub a thin layer of rubbing alcohol on strategically placed areas you want “distressed.” Fold up the bag and make as many wrinkles as you can. 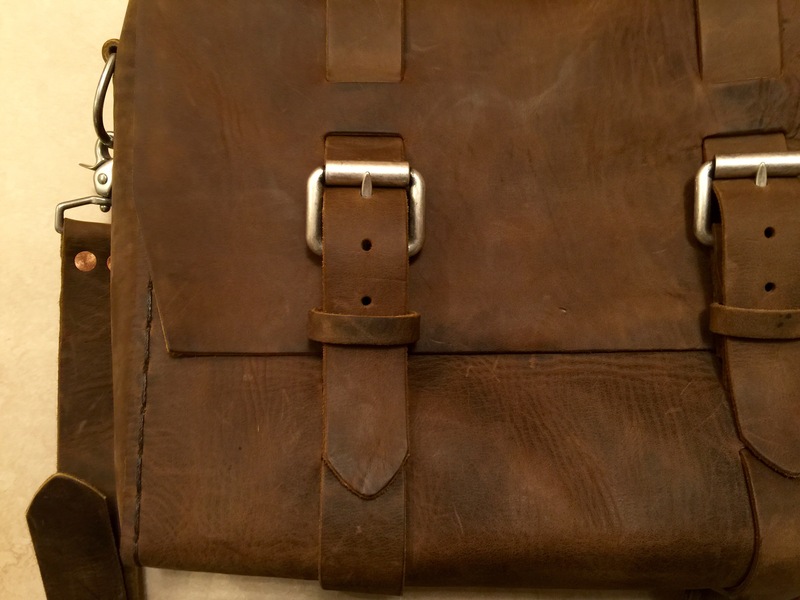 Check out this great article by Chamberlain’s Leather Milk. Drag the bag in some dust and gravel. My basement has a pile of concrete dust and chips from a demo project. I roughed up the bag in the mix. This creates scratches in the leather and will scratch up the hardware a bit. Go slowly so you don’t create more damage than you want. Some people recommend using sandpaper but I’m not a big fan because it creates artificial scratches. Clean it up with a damp rag to remove the dust and gravel. Spray the bag down with some water. This is going to dry out the leather and cause damage. On lesser products, I’d be afraid of causing structural damage but as a testament to Saddleback, their products are so rugged this barely puts a dent in it. Let the bag dry out completely. For the next couple days, keep massaging the bag. Bend it, fold it. Toss it around. At work, I keep it under my desk as a foot rest. My shoes then rub up on it all day long. Repeat this procedure as many times as you’d like until you get the desired effect. The alcohol, dust rub, and wetting and drying is damaging the leather. It’ll make the leather brittle and crack. Again, my bag showed no signs of this. Now that your leather is broken in, distressed in some areas, and thirsty for necessary oils, it’s time to condition it back to life. Use Clamberlain’s Leathermilk cleaner to clean up all the grime. You want the leather pristine. Use their leather conditioner or water protector. The latter will darken the leather slightly. Rub the edges of the leather with some beeswax. I use Otterwax which is a blend. Let the bag dry out overnight and buff it to a shine with a cloth. 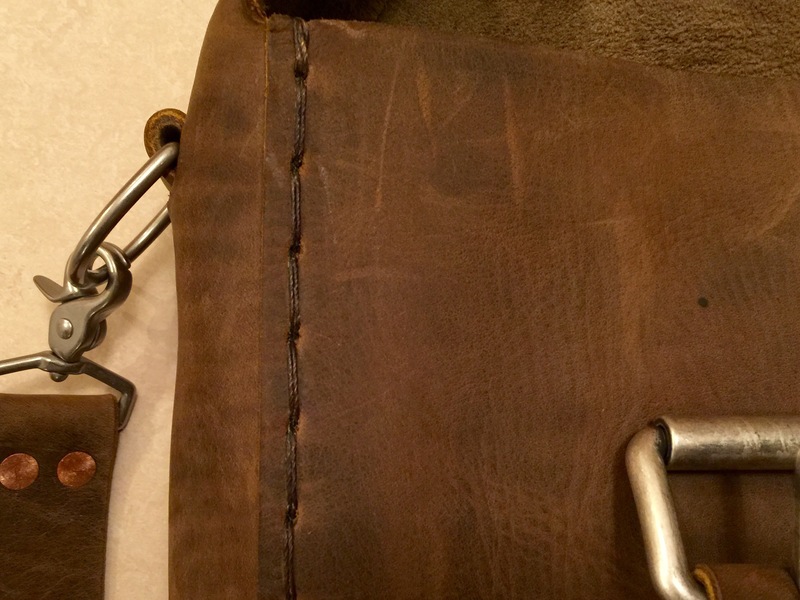 The best way to get that aged look and beautiful patina is to use the bag. Here are a few ideas to really wear in the bag. 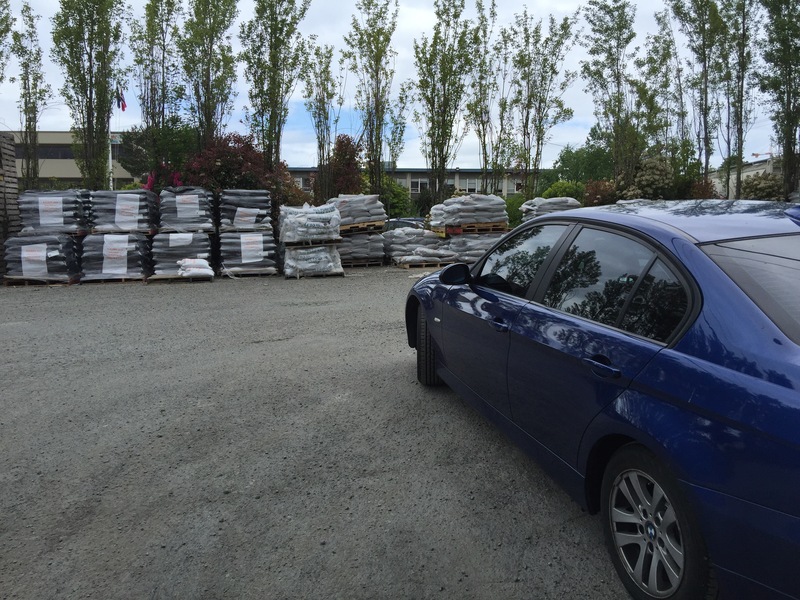 Fill the bag with stones of varying sizes and roll it around the yard. This will create wear on the inside and create a tumbling action. Fill the bag with construction tools and and use it at a job site. I’m a DIY remodeler so it’ll likely be my home or friends home. Expose the bag to water. Walk in the rain. Strap it to the hull of your kayak. In the Summer, leave it out in the sun for some UV exposure. Use the bag as a cooler for Summer picnics. Here’s my briefcase after the break in. It slouches and just flops down because it’s so soft. The scratches are barely visible after the two coats of conditioning. Now off to soak in some rays on a sunny day. I also didn’t like the handle in the briefcase. My messenger handle was made of just leather and had a pleasant creaking sound when it moves. 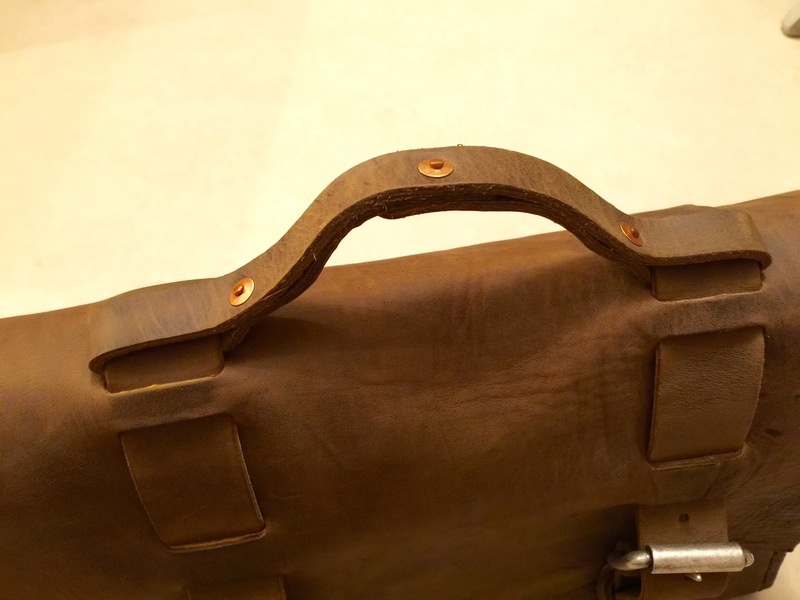 The briefcase handle has a small pvc pipe in it to hold its shape and to give it strength. It also made it really rigid. I tried a coping saw but that cut the leather. I then used some tin snips to cut kerfs in the ends of the pipe. Using some needle nose pliers, I was able to twist and snap off pieces. Eventually, I was able to use a pair of pliers and muscle it out. I’m sure I’ve completely voided my warranty now but I think my briefcase is now officially broken in, edges dressed, and the handle soft. For a basically brand new bag, it feels like I’ve had it for years. Now to use it daily and build the character naturally. I like things that last a long time and age well. There’s something about owning something for so long and seeing that story in the scuffs and patina of the object. It also teaches you something about patience. Natural patina takes time. The wear and tear of every day life adds to the story. Of course, there are ways to artificially age objects and create that “distressed look.” I’ve tried it myself but it only leaves you empty, a feeling of manufactured story telling. My first leap into this obsession started with my Saddleback Leather Messenger Bag I got on September 2013. I wanted something to replace my typical nylon laptop bags. New, the bag is super stiff due to the pigskin lining they use. It makes the interior really resilient and easy to clean but it also means the interior likely will look new forever. I got a chance to take the bag with me on a trip to Sayulita Mexico to break it in. Over the course of the next two years, the bag really broke in, especially as I bang it around from daily work. It softened up really nicely. A few days ago, I decided it was time to jump onboard and switch to the larger briefcase (top left in the picture below), along with a few other obsessive-compulsive purchases (the pouch and the travel case). I personally like the “new leather” where they’re less selective about cutting out stretch marks and scars in the leather. The Internet went on a big rampage and fuss over this change but for me, that’s why I love these bags. I know that these are not the best bags that money can buy. I had my eyes set on a really expensive briefcase from Marcellino or JW Hulme. While both are beautiful and professional, I ended up again with another Saddleback because I wanted something I could rough around and be okay with that. To me, the high end bags are like buying a premium luxury car. It’s capable but you really won’t want to take them off road. Saddleback is like a rugged Jeep that you feel okay knocking around and know that it’ll look good banged up. My briefcase shows some slight stretch marks on the back but the rest looks pristine. The second change that Saddleback made was a more suede-like pigskin instead of the plasticky lining. This was the deal maker for me. I like this softer and more natural look than the previous generation styles. Like my last experience with my messenger bag, this unboxing experience was the same. It comes out really stiff and not really usable out of the box. Here’s my break in procedure. I roll it around, jump in it, hit it, scuff it up a bit, and then stuff as many magazines and books as I can in it and leave it hanging over night. The weight stretches out the bag a bit. After three days of this, it’s softened up enough that I feel like I can start using it as my every day carry. For the next couple months, I plan on being a little rough on the bag including tossing it in the car and tossing onto the ground. No need to baby it. Like a nice leather pair of shoes, it’s going to hurt for a few weeks to months but the effort is well worth it. Here’s a pair of undyed leather shoes I got in Italy in May 2014. It started out as a really light yellow color. I wore this pair painfully through Venice and Rome on the cobble stone walkways. After months of sun exposure, dirt, rain, and wear, it fits like a charm. 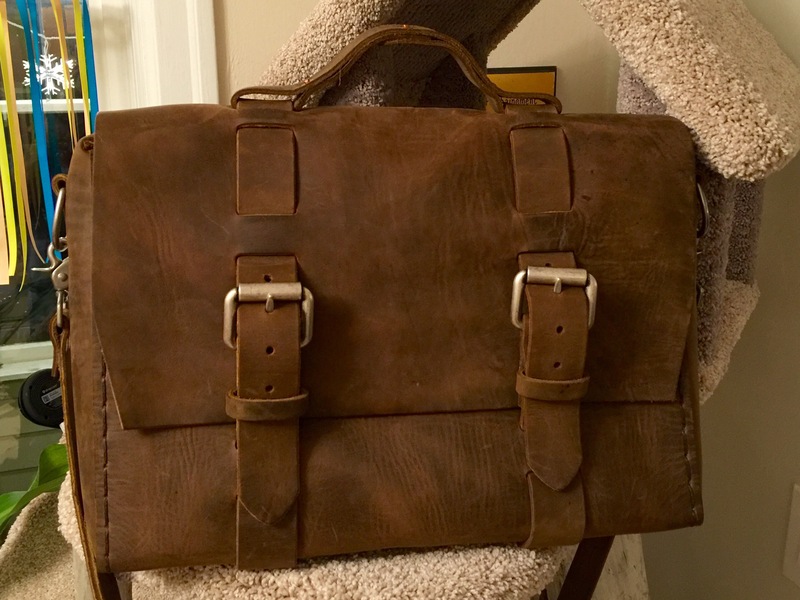 Back to my Saddleback briefcase. I made a few modifications. The edges are unfinished intentionally. The owner says it’s to show the quality of the leather. Frankly, finishing leather edges is a lot of labor and would add significantly to the price. Unfinished edges are fine, look rugged, and fits within the design of the bag. In this case, I wanted my edges slightly finished. I rubbed it lightly with some high grit sandpaper, wet it down with some water, and ran it over with a cocobolo wooden burnisher on my dremel. The high friction and heat causes the leather to harden up into a nice rounded edge. I then hand rub the edges with a bar of Otter Wax. If you read the reviews on the Saddleback bags, the common theme is that they’re heavy. I look forward to packing it with my work documents and equipment and lugging it out in 2016. My 2016 resolutions is to be mentally and physically resilient. This is a chance for me to test out that physically resiliency. Punching down cat5e to a patch panel before switching over to the more costly cat6. There’s something about jumping into a first edition product. In 2007, it was iPhone and 2010 was iPad. I’ve now added Apple Watch to the mix of devices. As with all first generation products, there’s a lot of kinks to be worked out and features and functionality to be developed. Lets talk about the ecosystem of devices from desktop to wearable. First off, the MacBook Air is my working laptop (Surface Pro 3 for work). The iPad fits in between my iPhone as an in between product. Finally, the Watch is now an always on be device. That’s just a lot of devices. Is it really necessary and do we really need (an iPad and a Watch)? Will there be a day when all these devices become one? My prediction for hardware is no, but yes for software. The spectrum of devices is useful so that we can customize our personal work styles. If you typically work at your own desk, then the laptop becomes your go to device. If you’re mobile a lot, perhaps a tablet will be sufficient for the work on the go. Since there’s no shortage of reviews for Apple Watch, I’m not going to add yet one more review. Instead, I’m going to highlight my learnings since putting my Apple Watch Sport on. Notifications – This is where things can go overboard. Instead, I have my notifications setup to only ping me for VIPs. It’s a great way to get a light “tap tap.” The fitness tracker features is also a good reminder via the tap to get up and move. It’s also great at letting me know that I get next to zero exercise each day. Phone and Messaging – With the Watch, I’m finding myself not holding on to the phone all the time. I get pinged when a message or call comes in. I rarely take calls on the Watch unless I’m scrambling to find the phone. Home Automation – At this early stage, I’m able to flip my lights on and off to different scenes via Phillips Hue. It’s seems overboard until you’re on the couch holding a baby and your phone is in the other room. I’m also able to control my Apple TV via the remote app. In my car, I have an Automattic dongle installed and Apple Watch shows me the last location I parked (super useful when you’re forgetful). The Watch is like having someone tap you on the shoulder, giving you a wink, and letting you go on with your business. It’s a very subtle and gentle reminder. Most importantly, it’s not all up in your face. It’s been a bit more than a week and I am completely sold. It’s not just another unnecessary device. It’s a partner with your phone, humanizing the crackberry-mentality.